Last week I had introduced you to Refugio Hipólito Ruiz Quintero, of La Bocana, Sonora, whose nickname is Cuco. Today we will examine two of his masks that I purchased in January, 2012, after they were danced for several years in Rio Mayo fiestas. Like three of last week’s masks, these are carved in a traditional design that reflects the work of an earlier generation of Rio Mayo carvers. 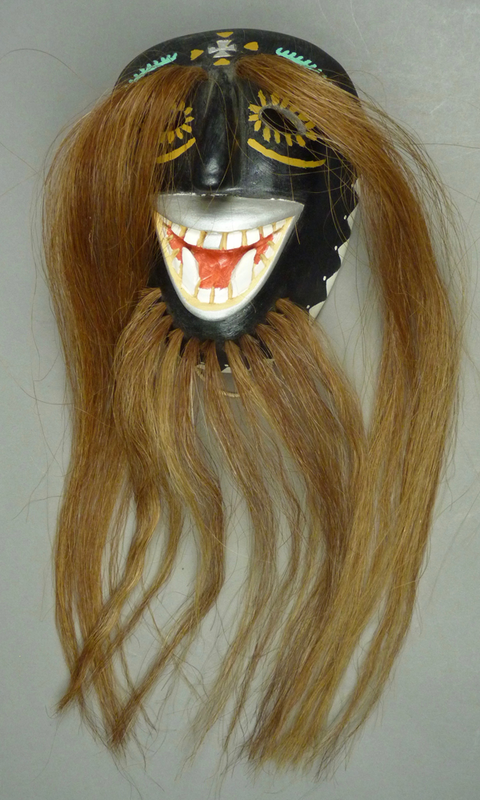 Again we see a Rio Mayo mask that has been fitted with the long hair and brows found in Mayo areas of Sinaloa. 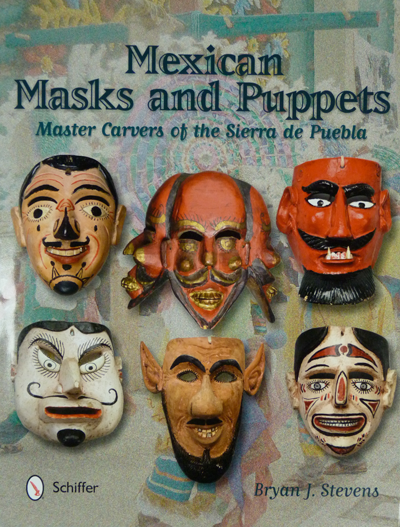 I began this series of posts about Mayo Pascola masks from Sonora by examining the work of carvers who had been studied by James Griffith, back in 1965. Gradually we have been shifting towards other carvers and more recent masks. In last week’s post about masks with relief carved snakes we clearly ventured into the world of contemporary Rio Mayo carvers, and they will be the subject of the next few posts. Today I will begin with the contemporary carver whose masks introduced me to this group, back in 2010. As has often been the case, I learned about this artist from my friend Tom Kolaz, who said, “His artistry blows me away.” We agreed that we should buy some masks by this talented young man in order to encourage him to develop as an artist, and over the year that followed I purchased four undanced masks. As it turned out, Cuco was stimulated by our support. He had already been making masks that were modeled on those of the last generation of carvers, such as Bonifacio Balmea, and this is the style that you will see in this post. However he also began to experiment more bravely with a modern style that appealed to Pascolas who were his contemporaries. These new-style masks were an immediate hit, and over just a few years Cuco became quite popular with these younger dancers, so much so that none of his most exciting masks ever came my way. I tell this not out of unhappiness, but to alert you that the masks in my collection are just the tip of the proverbial iceberg, and his recent masks are among the very best in the Mayo area. Initially I didn’t even have a name for this carver, later I learned that his nickname was “Cuco,” and eventually Tom told me that his formal name is Refugio Hipólito Ruiz Quintero and that he lives in a very small town near Etchojoa, Sonora. I will call him Cuco. You will see that the artistry of Cuco’s carving speaks for itself. 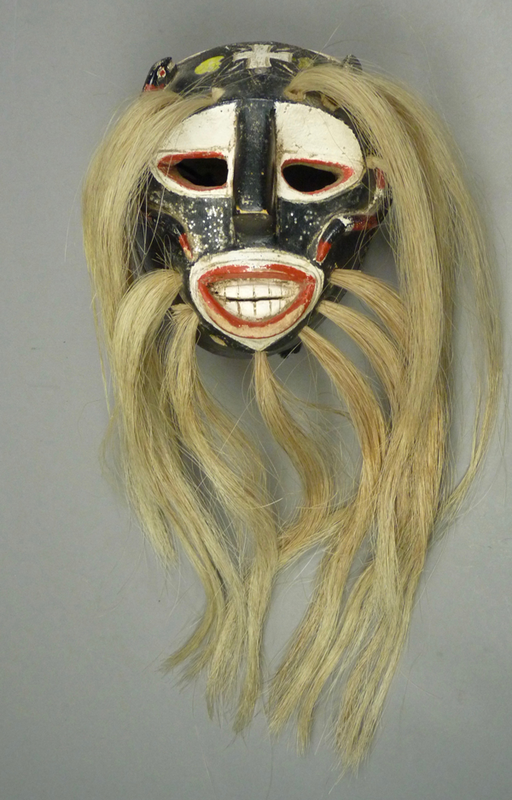 Here is one of the masks from that first group of four. As I mentioned in earlier posts, the very long eyebrows and beards seen on Mayo Pascola masks in Sinaloa have gradually been adopted by the Rio Mayo carvers in recent years. In 2004 I purchased a Rio Mayo Pascola mask from Dinah Gaston that had snakes carved in relief on the face. Dinah had visited Leonardo Valdez in Etchojoa in June, 2000, and he had taken her to a fiesta. There she obtained this mask from the lead Pascola, Bartolo, who reported that he had danced with it for 15 years. According to Tom Kolaz, Bartolo Matus was not only the lead Pascola in Etchojoa at that time, but also he probably was the mask’s carver. Perhaps he was also the originator of this style’s use in the Rio Mayo villages, Tom speculated. He was so intrigued by this mask that he made further inquiries through contacts he had in that region, and ultimately he discovered additional masks there with relief carved snakes on their faces. I obtained one of these from Tom in 2006. In today’s post I will show you these two exciting masks. Here is the one that was collected by Dinah Gaston in 2000. It was said to date to c. 1985. The snake bodies create the illusion of exaggerated cheekbones. Today I will show you more masks by Francisco Gámez that are in my collection. The first mask, which I purchased from my friend Tom Kolaz in July of 1998, has the fangs of a Vampire. This mask had apparently been brought up to a Tucson Indian Arts store by Barney Burns and Mahina Drees. There it was purchased by a Yaqui Pascola dancer, Reynaldo Romero Matus, who lived at the New Pascua Indian Reservation. He danced with this mask at Nogales in October of 1989, and later sold it to Kolaz.